Never mind Kagawa, here’s your Asian striker. In other words, because Kagawa isn’t around. Well, that’s not very fair, is it? Ulsan Hyundai qualify to the AFC Champions League final, the fourth in the row for K-League teams, Keisuke Honda’s kicking around in Russia, and Manchester City is interested to give Hideki Ishige a training run. But it’s another calm weekend for Asian football. Certainly Shinji Kagawa is the focal point of Asian representation in world football, just like Jeremy Lin does in basketball. And yeah, it’s making me nervous if he does play – worried that he would play badly. Again, that’s not very fair considering that he has scored two goals and several assists in England and Europe, better than Rooney and Welbeck. But while many in Japan overhype him (as usual with any Asian sporting star), many others want to see him fails to make impression in Manchester United, and not only in Europe. Perhaps some of them are also in Asia. They have no problem with a Turk, or Barbadian, or an Congolese, but many people in this world still think that an East Asian doesn’t belong on the pitch. Of course, no one thinks that Ali al-Habsi or Sanharib Malki is doing what he’s not supposed to do. Sadly, there’s not much replacement could stand in for Kagawa. Whether he plays or not, these days it’s hard to admire Park Ji-sung as the captain of Queen’s Park Rangers (although QPR is probably the only team in Europe to feature players from all confederations, thanks to him, Ryan Nelsen, and Junior Hoillet). The worse thing I can do is to watch Southampton – Maya Yoshida is tumbling and fumbling once more week after week, and Tadanari Lee is never around, not even on the bench (please choose him over Emmanuel Mayuka. Please). Of course, I am envious of the Belgians – five years ago they were the jokes of Europe, now their players are sought after even perhaps more than the Dutch. Five years ago, Japan and South Korea could handle them. A fate that Kagawa has is that he’s seen as the poor replacement to Eden Hazard. Of course, if you think about it, at least the Japanese and the Koreans are not Australians. Yeah I know, I’m thinking about Koo Ja-cheol rather than Ryo Miyaichi when trying to compare them with Kofi Danning. First, of course the best news this week is Ulsan Hyundai. I’ve taken the fact that a Korean team will play in the ACL final for granted and it happens again. Yeah it’s good luck, but in any year there’s must be one Korean team that have the guts, the tradition, the determination, and the skill to get forward. Japan qualified three teams to the playoff round and none of them had enough of those requirements. Seongnam, in short, was just out money just like Bunyodkor were, but even the glamour-less Uzbeks still could overcome Adelaide United. The ACL 2012 were full of unfulfilled fairy tales, it wasn’t UEFA Champions League 2003-04 (final: Porto versus Monaco). 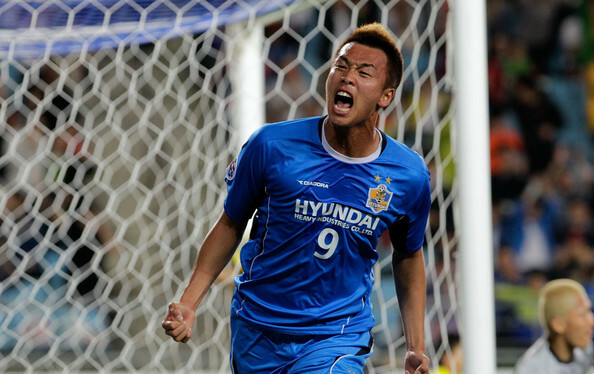 No Guangzhou, no ‘wild card’ Adelaide, and Ulsan dispatched Al Hilal too easily. In the end, it was the battle of giants (also Al Ahli were also supposed the third rank team behind Hilal and Ittihad). So what makes Ulsan great? Simply Kim Young-kwang, a cultish goalkeeper, and the ex Gamba Osaka duo of Rafinha and Lee Keun-ho. There’s one in the list of reasons of Gamba’s sudden decline. Their midfielders are not famous, while defenders Kang Min-soo and Kwak Tae-hwi can be as clumsy as Manchester United defenders (evident in the first half of last mid-week match against Bunyodkor). But I’ve taken another assumption for granted – AFC representatives will become the third best team in the FIFA Club World Cup. They can still take on African and CONCACAF champions anytime. ….suddenly I wonder if J. League disinterest with the ACL is also related to the fact that it only needs to win the J. League to qualify for the Club World Cup. Then again, I don’t want the CWC to be hosted in the Gulf. This entry was posted in Asian Leagues, Asian Overseas, Continental and tagged AFC Champions League, Al Ahli, English Premier League, FIFA Club World Cup, Gamba Osaka, Hideki Ishige, Kang Min-soo, Keisuke Honda, Kim Shin-wook, Kim Young-kwang, Kofi Danning, Koo Ja-Cheol, Kwak Tae-hwi, Lee Keun-Ho, Manchester City, Manchester United, Maya Yoshida, QPR, Rafinha, Ryo Miyaichi, Shinji Kagawa, Southampton, Tadanari Lee, Ulsan Hyundai by asiafootball. Bookmark the permalink.